You Hate The Loss of Privacy and Control, But Like Social Networking? Do you share videos, music and post comments to your friends on Facebook? After logging in, have you ever wondered who else may see your personal information? When you login have you ever thought to yourself, How can they show me advertising that reflects perfectly to where I am located? Its about time you learn about a social network site that keeps your privacy and personal information truly private instead of having to worry about these same concerns on Twitter and Facebook. What Is The Next Social Network? IS A GUIDE TO LEARN WHY IT WILL MOST LIKELY BE THE FUTURE OF SOCIAL NETWORK MARKETING, WHAT THIS NEW SOCIAL NETWORK SITE IS ALL ABOUT, AND HOW IT DIFFERS FROM THE SOCIAL NETWORKS OF TODAY. You regularly log into your Twitter and Facebook accounts each day and look forward to seeing what your associates and friends are doing. You look forward to seeing what they are doing with their families and friends. Its simple, you login, head to your home page, and instantly know whats going on. Have you ever logged in and thought to yourself, What personal information am I exposing to world that I dont want to? Its no coincidence that banner ads which target your specific location or interests appear immediately after logging in. Its painfully obvious that social networking sites are built in mind to turn a profit like other technologies. While on these sites, you will see all kinds of advertisements and at that point it becomes abundantly clear just how much they actually do know about you. Most of us dont want technology shoved down our throats, but at the same time we cant seem to function without it and want to see the latest videos, hear the most popular music, etc. There were four New York college students who believed in a need for change and felt that sites like Twitter and Facebook had too much control over our personal information. Hence, Diaspor, The Next Social Network was born. The future of social networking and social media marketing will be explored in depth within What Is The Next Social Network?, along with how it came to be. If youre using these other social network sites, youre giving up part of your privacy and personal information which we cover in full within What Is The Next Social Network? Did you know there are logs and logs of information out on the Internet that is used for marketing products and services to you? We take an in depth look into this and more. We look into how our society is ever evolving due to the fact that our lives are becoming more and more dependent on computers. Max Salzburg, Rafael Sofaer, Ilya Zhitomirskiy, and Dan Grippi were the four New York college students who came together to create Diaspora. We will also go in depth with the history of Diaspora. Almost all social networks are built around a centralized concept. However, Diaspora utilizes a decentralized concept while being an open-source platform which in turn gives you total control over your personal information. Well examine how Kickstarter works and how these four college students used it to raise $10,000 they needed to get started on Diaspora. Due to the viral buzz started by Diaspora, they actually received over $200,000! Ever dream of having your own personal server or freedom box without a middleman in which you have complete control over? In What Is The Next Social Network? we examine just that. We take a closer look at how the freedom box concept within a social network cannot be infiltrated, censored, or filtered by anyone which enables you and your friends to communicate privately. We go into the seed-to-seed concept which enables you to transmit all sorts of information from one computer to another. The best part is that this information is encrypted and completely useless to anyone who may intercept your private information. We dive into how you can keep your family separate from friends, or keep your work life and non-work life apart through a feature better known as aspects within Diaspora. How open-source software platform such as Diaspora allows it to be easily updated, upgraded, and modified to quickly fix any security loopholes or bugs. In What Is The Next Social Network?, we take a closer look at case studies of large companies such as Sony Ericcson, Burger King, Target, and The Ford Motor Company utilize social media sites like YouTube and Facebook to increase their profits and enforce their reputations. How these four college students utilized social networking sites to assist them in spreading the word about Diaspora. Did you know that you can use Diaspora to make the other social networks such as YouTube, Twitter, and Facebook more secure and private? This means you will be able to use the best features of each social site within the framework of Diaspora. We will examine how its easier than ever, not to mention more profitable to implement using Diaspora. Unlike other social networking sites, another benefit of using Diaspora is that you can keep some of your sacred marketing secrets private until youre ready to reveal them. Virtually everyone find it convenient to shop online form the comfort of his or her home and office. By selling online there are many people who make a substantial amount of their income whether it be part-time or full-time. Other online environments pale in comparison to Diaspora when it comes to dealing with security and privacy. There will be plenty of opportunities to make money through Internet Marketing through Diaspora. It is our goal to give you some ideas on how you too can take advantage of Diaspora to make money. You will learn how Diaspora differs from other more popular social networks through this most informative and complete guide on how you can utilize it for business and personal use. Jump on this before the rest of the world discover it and you too can reap the rewards. Youre about to become a Diaspora expert! Take advantage of this new social network before others do by learning what makes Diaspora different from the rest. A valuable resource such as this you think would be expensive. However, you have a grand opportunity to purchase this awesome eBook at a incredibly low price, but for a very limited time only. As the popularity of Facebook, Twitter, and other social network sites grow, we should all be more cautious and guarded with our own personal information. Once the world discovers Diaspora, its very likely that its popularity will expand exponentially considering its compatibility with most of todays popular social networking sites. If youre the first to let them know about Diaspora, just think how highly they will see you as an expert and how in tune you are with the Internet today. 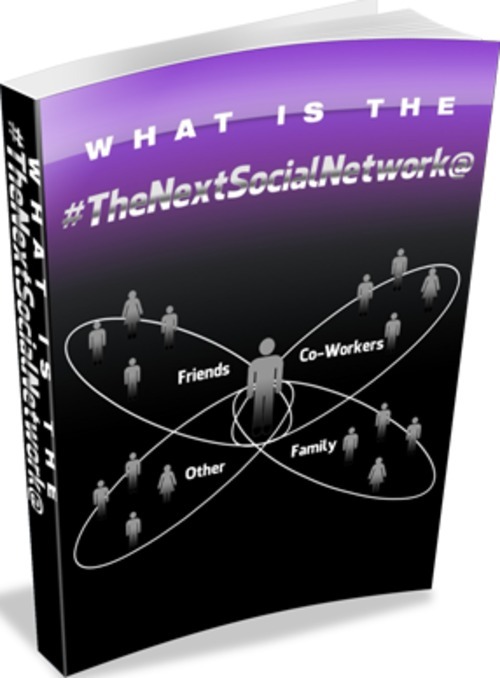 This book, What Is The Next Social Network?, will do that for you. If you dont want to lose an opportunity to be seen as the expert on social networking and social media marketing amongst your peers, then dont delay and get What Is The Next Social Network? today!